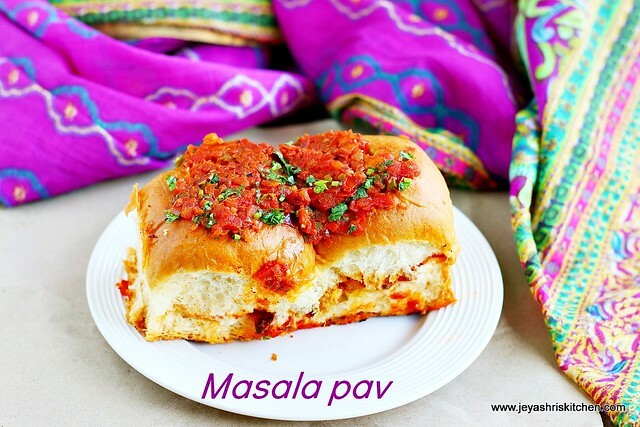 Masala pav recipe is a popular mumbai style street food. When i posted tawa idli recipe, many of my friends here told me about the masala pav. the way they narrated about that, made me to try it out soon. Last week when i made the dabeli, i was left with one pav bun and tried masala pav with that. The recipe i adapted from Tarla dalal's website. It tasted awesome. Yesterday i went to mustafa and bought these eggless pav buns to try out the masala pav recipe. You can use the burger bun or hot dog bun too. Try this for an evening snack and enjoy your tea time. Chop the onion, tomato and capsicum finely. In a dosa tawa or a pan add the butter and add the chopped onions. Cook till they turns translucent. Add little salt to the onions. Now add in the tomatoes. Cook for 2-3 minutes. Do not keep the flame high. Add in the capsicum and mix well. Let this cook for a minute. Add the red chili powder and pav bhaji masala. Mix well and cook for few minutes in a low flame. Using a potato masher, mash the onion tomato mixture in the pan. Once it is mashed nicely add the lemon juice and mix it nicely. Add chopped coriander leaves. Keep it aside on one side of the pan |tawa. Add 2 tsp of butter to the pan. Slit the pav bun into two. Do not cut them fully. You can use burger bun or hot dog bun too. Place it on the pan, the bottom side facing down. Toast it for few seconds. Turn it up and put some onion tomato mixture on both sides of the bun. Cover it and toast it on both sides. Put some onion tomato mixture on the top. You can add some cheese on the top in the last before serving. Do not lessen the butter mentioned, it gives a nice taste and flavor to the masala pav.